^ iCyclone Facebook Page. Photos: Tropical Storm Dujuan is an odd creature. 2015-09-23. 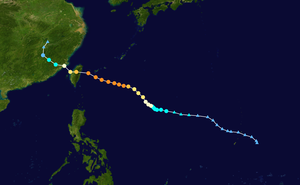 Then today, the Euro shifted *way* W, now showing landfall in N Taiwan! ^ 中央廣播電台. 颱風杜鵑變中颱 中秋節發海警. 2015-09-26. ^ 交通部中央氣象局. 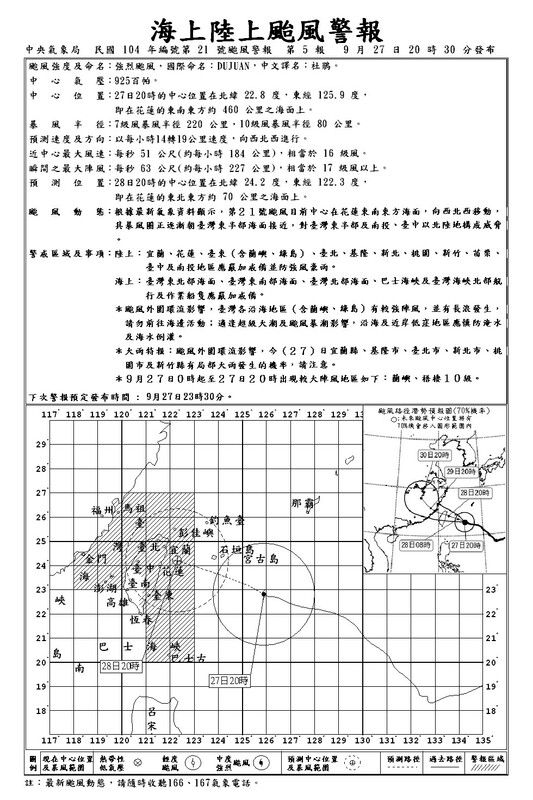 杜鵑颱風　颱風警報第9-2報. 2015-09-28. ^ 杜鵑颱風造成森林鐵路58K路段嚴重災害. 林務局嘉義林管處. 2015-10-03 [2015-10-06]. 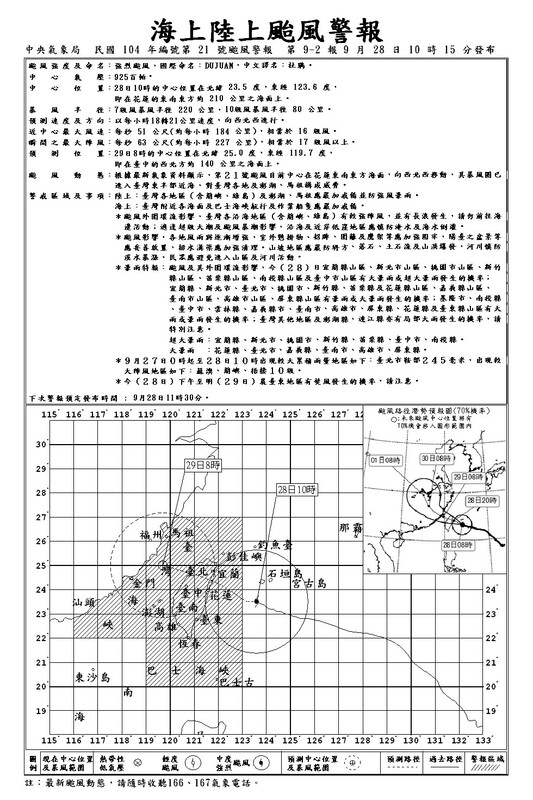 （原始内容存档于2015-10-06） （中文）. ^ 89.0 89.1 風の状況. 国土交通省気象庁. ^ 菲律賓大氣地球物理和天文服務管理局. 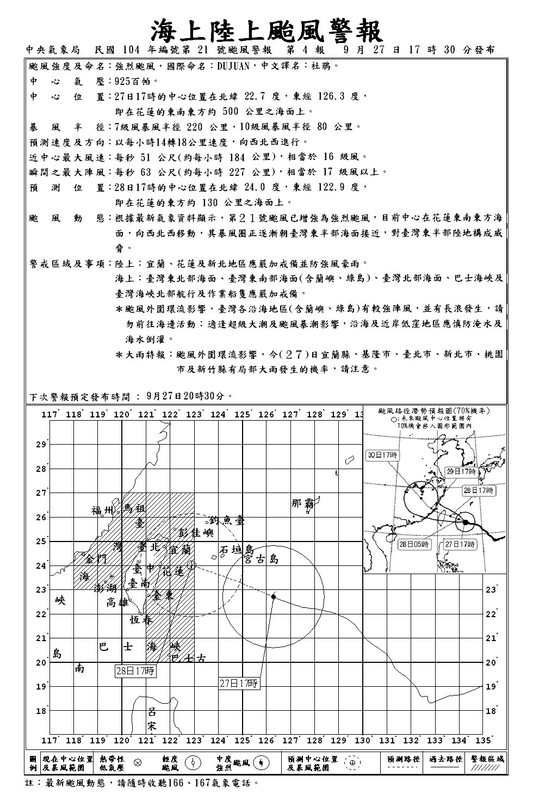 Severe Weather Bulletin #9-- Tropical Cyclone Warning: Typhoon "Jenny". 2015-09-27. （原始内容存档于2015-09-27）. ^ 菲律賓大氣地球物理和天文服務管理局. 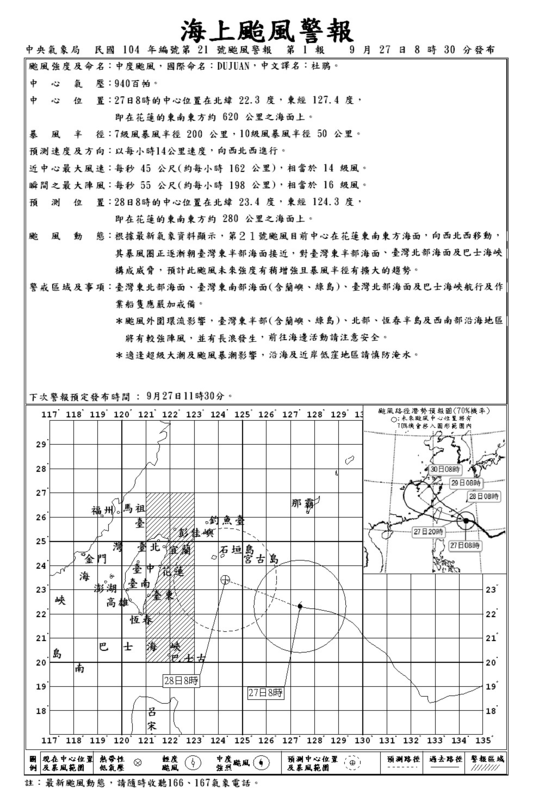 Severe Weather Bulletin #16-- Tropical Cyclone Warning: Typhoon "Jenny". 2015-09-28. （原始内容存档于2016-03-04）.